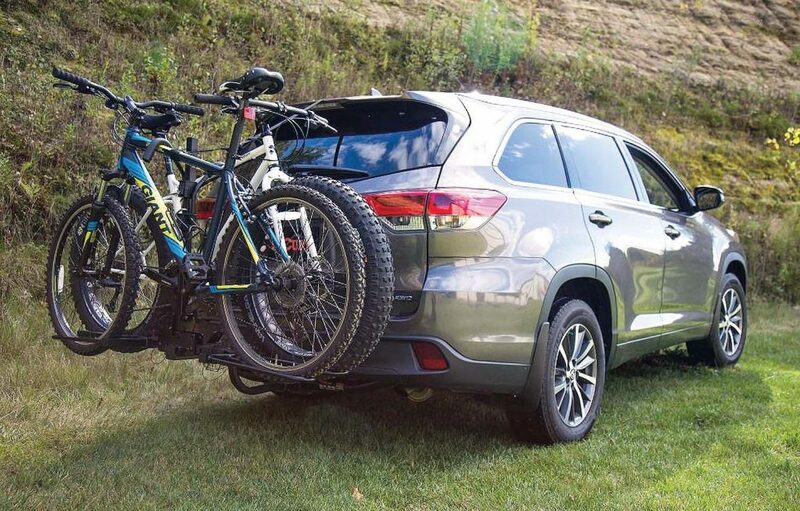 Some of the easiest bicycle racks to install are the ones that take advantage of your vehicle’s trailer-hitch receiver. The Curt tray-style racks are compatible with 1.25- or 2.0-inch receivers and can handle two bicycles with a total weight of up to 90 pounds (double that amount for the four-bike model). The tilting feature gives you access to your trunk or liftgate with bikes securely attached to the tray. When not in use, the rack folds out of the way against your vehicle. Pricing starts at about $250 for the dual-bike rack and $465 for the four-bike version. You can also purchase a set of wheel cradles for fat-tire bikes for $50. Go to www.curtmfg.com for full details.